The Yu-Gi-Oh Trading Card Game allows kids, teenagers, and adults to relive the exciting Duels that take place in the animated Yu-Gi-Oh series. In Yu-Gi-Oh TCG, players use the cards they’ve collected to construct decks and then Duel against each other in a game of strategy, luck, and skill! We have Tournaments every Friday night at 7pm with a $5 entry fee! For each new set we host a Sneak Peek event where players can open packs of the new set before they release! Check the events calendar to keep up to date on the next Sneak Peek! We also host Yu-Gi-Oh Days, Qualifer Tournaments, and other special events! 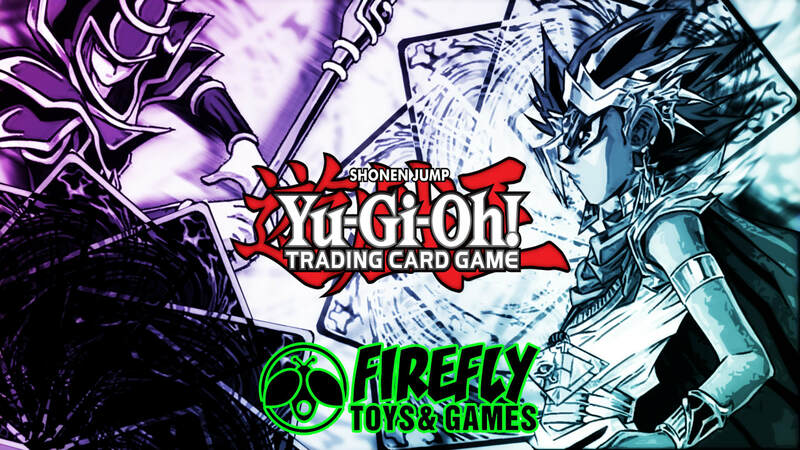 As a Konami official Tournament Store (OTS), we are allowed to sell new sets one day before mass market release date, so be sure to head to Firefly for all your new Yu-Gi-Oh needs! We also have a large selection of Yu-Gi-Oh sized card sleeves, playmats, and YGO accessories!